It’s time for Big League Clu’s (College) Basketball Jones. 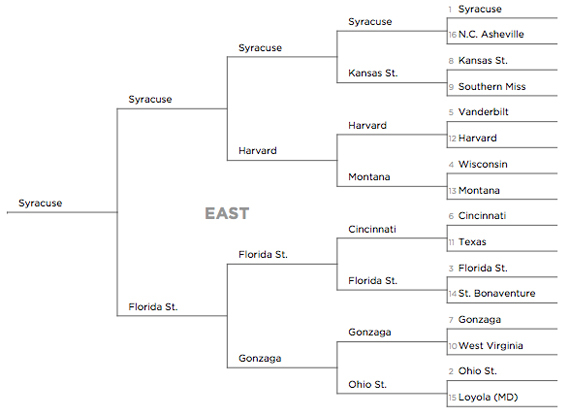 Here are his predictions for the Eastern bracket! March Madness is finally upon us!! Let’s start by jumping right into the thick of each region, and breaking down the first and potential second round match ups. After that, we’ll spend the month of March going through all of the rounds of the tournament until we reach the National Championship game on April 2nd. If you want to look like the champ in your office’s tournament pool, I suggest you start taking notes. This year’s Orange team is by far one of the deepest in the tournament and ever for coach Jim Boeheim. Their one achilles heel, oddly enough, is that they rank 341st out of the 345 D-I schools in defensive rebounding percentage, an incredible stat considering they are one of the tallest teams in the country. 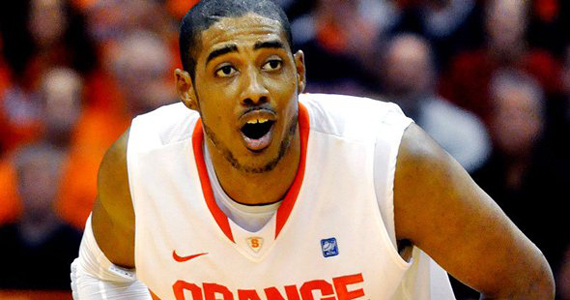 Despite the shocking news that star player Fab Melo (pictured above) will not be elligible for the entire tournament, ‘Cuse’s depth should get them through. They’re just going to need freshman center Rakeem Christmas (not a made up name) to step it up a bit. The Bulldogs are a scrappy bunch that are known for getting the majority of their points from the line (26% of the teams points came from free throws). Last year UNC Asheville faced #1 seeded Pitt and was thrashed, will the same happen again this year? Probably…. As far as playing style goes, Southern Miss and K State, are on opposite ends of the spectrum. The Wildcats are a tough, gritty rebounding team that looks as if they were finally able to click late in the season (just look at their big win over Missouri). Without a doubt, this team could be a sleeper, and I think it is one of the region’s best mid-level seeds. The Eagles, on the outer hand, are a team who like to shoot from the line as often as possible. They take advantage of any chance they have to score, and do not turn the ball over too often. 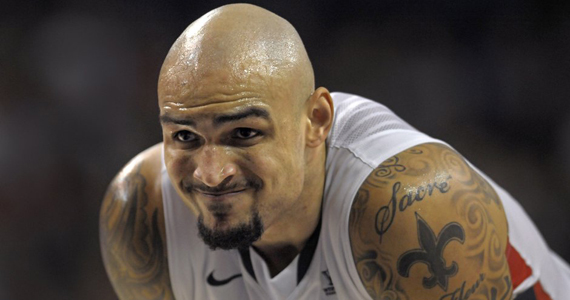 They are a slow paced, “grind it out” type of team, which does not match up well against K-State. After a stunning upset of Kentucky to win the SEC Tournament, Vanderbilt secured the #5 seed. They face 12th seeded Harvard, which has not been in the NCAA Tournament since 1946. The Commodores are well-versed on offense, but defensively challenged. They like to shoot a lot from beyond the arc, but turnovers and foul trouble have often overshadowed Vandy’s high powered offense. As for Harvard (or Jeremy Lin University), defense is the name of the game. In Ivy League play, the Crimson have shellacked their fellow Ivy leaguers by conceding a mere 0.90 points per possession (or ppp as I like to call it! ), while ranking near the top three in all other defensive categories in the Nation. If you’ve been paying attention, you know that I have previously mentioned this in numerous posts about Harvard in the past. The Grizzlies enter the tournament on a 14 game winning streak (currently it is the 2nd longest in the nation). Montana is a scary three-point shooting team, and they’ve proven it by they converting over 38% from deep territory. This also seems to be one of those “one year wonder” teams because of their senior leadership and strong defense. They pose a major threat to destroy office pools everywhere. Wisconsin however, is the type of team that that cashes in on opponent frustration. They play hard defense and protect the glass with the best of the best in the nation. Fresh from their loss in the Big East Tournament championship, the Bearcats showed some poise, as they rarely made any mistakes. during their big run. They were rewarded with a six seed, and a good opportunity (even through their season was nearly derailed by that brawl with Xavier earlier in the year). With the help of Yancy Gates, who typically thrives on second-chance opportunities, Cinci ranks 9th in the nation in offensive turnover percentage. Can they make a run? Meanwhile, the Longhorns need some magic from their leading scorer J’Covan Brown (20.1 ppg), as the team has struggled with ‘their shooting this year. They check in at 137th in the nation in two-point shooting…seriously? And teams like Drexel and Seton Hall didnt even get an invite? Terrible….anyways, Texas will either survive or go home solely based on Brown’s play, because the rest of the team has done nothing all year. With their first ACC tourney championship in hand, and the 11th-best defense in the country, FSU looks to aim for yet another tournament title. The seminoles typically thwart the opposition on all points with a hard nosed defense and then attack with a barrage of three-point shots. It is tough to judge how far Florida State can make it in the tournament, especially when they sometimes seem invincible (vs. North Carolina & Duke), and then Other times look completely lost on the court (vs. Princeton, & Miami). The bracket busters here though (St. Bonaventure) punched their way into the big dance with an incredible run through the Atlantic 10 tournament with senior forward Andrew Nicholson at the helm. Nicholson, a legitimate NBA prospect, played sensational ball, blocked shots and scored at will (he had 26 points, 14 rebounds, and 8 blocked shots in the championship game vs. Xavier) in the tournament. Back in the tournament for the 13th straight year Gonzaga always seems to be a sleeper pick for many to make the Final Four. In reality, they have not made it past the sweet 16 since 1999. They are led by Defensive Player of the Year Rob Sacre and conference Newcomer Kevin Pangos. As far as West Virginia goes, Bob Huggins & Co. seem to have stumbled down the stretch, losing seven of their last 11 games). They are desperately trying to find themselves on the court, instead of finding themselves in a one-and-done situation. They are led by senior forward Kevin Jones, who is one of the country’s best players and can, at any moment, single-handedly change the momentum of a game. The last time the Greyhounds punched a ticket to the big dance, True Lies was one of the year’s best movies (I know this because we were talking about Tom Arnold & Swartzenegger at work the other day). Loyola won the MAAC championship in a low-scoring affair, 48-44 over Fairfield University (Sorry Stags!). They led by their sharpshooter Robert Olsen, who is shooting over 44% from three-point land. Ohio State, as everyone knows, boasts one of the best defensive rebounding teams in the nation. They may only be 7-6 in games against top 25 teams, but they know how to ball and could be an easy favorite to make it to the final four. Prediction: ‘Zags are a sleeper yet again! Read it and weep, everyone. And then go change your brackets.